I hadn't heard about Sidart until I saw them receive the accolade of Metro's Best New Restaurant in Auckland for 2010, early in the year. Since then, they had been on my To Do list and for my birthday Jane booked us in for what was to be a superb meal. Located upstairs in the dated Three Lamps Plaza in Ponsonby overlooking Auckland city, Sidart has seating for ~34 people. Seating is not as private as some other top restaurants in Auckland, however this did not detract from the meal. A 7 course tasting menu was on offer, of which we could order any items as entrees or mains if we desired, but we opted to go for the 7 course degustation; I also decided to go with the accompanying wines. Each dish was prepared with love and a lot of thought. The accompanying wines also worked well, and were generously poured. From manuka & coffee-smoked dishes where there was a glass over the meat and the smoke released at the table to creative morsels such as crab ice-cream, soy & mirin whip and inky black parsnip puree, each dish was something special. I was expecting a bit more molecular gastronomy but was not at all disappointed in each of the fine dishes I was presented with. We thought there may have been an amuse bouche and possibly a palette cleanser such as a sorbet but this was not to be. From a service perspective the wait staff were exceptional and explained each dish in immense detail including being able to answer any probing questions we had along the way. In terms of the wine, our waiter explained the characteristics of each wine and why it was a good match. The food arrived in a timely manner and the wait between courses was quite appropriate. It was a magnificent meal and we will very happily return. I'd planned to make pasta for dinner the last 2 nights running, however, in classic post-christmas recovery mode, we've managed to fail to buy eggs on both days. So we just figured we'd pop out for whatever we could find, with a couple of options high on our list of intentions - bearing in mind that Auckland has both emptied out and seeminly shut down for the christmas period. Sure enough, the first 3 restaurants we had in mind were all shut. And then we fortuitously did a u-turn near Pane & Vino. Simon had this traditional little Italian trattoria on his 'must try' list, so try we did. Firstly, let me just say that Tito is one of those amazing individuals who defines the term 'larger than life'. He is a force of a nature, a bundle of energy, a caricature of Italian-ness, and while I'm fairly confident that almost every time he spoke to us it was in Italian, his accent is so very present, that even his english was fairly Italian! I love to see any business owner with his level of passion and utter love for what he does! He is never short of a heartfelt smile, and regularly sings along with whatever modern or classic Italian track is being played, while he easily moves from waiting, to cooking, to serving, to barista, to convivial host! I could go on all night, but I really ought to get to the food! We decided to share the special starter of the evening - a classic bruschetta with garlic, buffalo mozzarella, tomato & fresh basil. This was absolutely delicious. Loads of garlic, but beautifully balanced, the mozarrella was lovely, and the tomato full of flavour. The bread itself was a smidgen burnt on the edges, but every mouthful was so good, I almost forgot about that. Next, Simon had the special ravioli of the evening - a carrot & parmesan ravioli with a tomato & beef ragu and parmigiano reggiano - this was rich, hearty and packed with flavour. 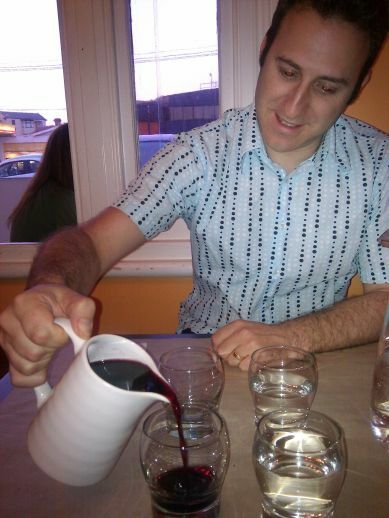 Oh - I should also mention that we ordered a 1/2 litre carafe of their house-red-wine - a montepulciano. This was served classic trattoria style from a jug, in standard table glasses. I did mention this was traditional trattoria style didn't I?! Ok, back to the main course - I decided to NOT order pasta, seeing as I really do enjoy making my own, and would rather try something that I'm not planning on doing at home. So I settled on Calamari ripieni alla viestana - whole squid stuffed with bread, egg, parmesan, garlic, and cooked in a tomato & white wine sauce. The sauce, like Simon's, was rich and bursting with flavour. The squid was unexpectedly tender, and very good. I would order this again. It was served with a small salad and a basket of bread - which was perfect for mopping up the last of the sauce. We also had the steamed green veges with garlic, which was a bowl of green beans this evening. As we were finishing our meal we saw a pizza at another table and it looked absolutely amazing - we may yet be back later this week for pizza! I overheard another diner ordering tartufo for dessert. We weren't planning on having dessert, however I can never find tartufo on menus in New Zealand and it was one of my favourite dining memories from our time in Italy, so we did decide to share one of these this evening. It was really very good, but we are glad we shared a single dessert rather than both ordering something! For something a bit different to end on, I ordered a Maretto - an espresso shot with lemoncello. I'm not sure, but it tasted like it was almost a half & half ratio of coffee to lemoncello! Good thing Simon was driving methinks! I'd never thought of pairing coffee & lemoncello - it was surprisingly good! Prices were generally lower than I'm used to paying for Italian in Auckland - we paid about $90 for a shared entree, a pasta main and a non-pasta main plus a side of veges, a shared dessert, alcoholic coffee & 1/2 litre of wine. Their corkage for BYO is also very reasonable at $5. Yes, we will be back, we will take others with us and we will recommend Pane & Vino to friends. With a lovely berry and leather aroma, this medium length deep red/purple wine has medium tannins and is packed with dark berry flavours. This wine should keep well for a couple of years (at least), and is drinking well now. With its tannin structure, a Scotch Fillet steak would be a great accompaniment. With a rich golden straw colour, this wine has a nice light oak aroma. On the palate there is light oak, a little bit of acid and a nice buttery flavour. With a medium length, the wine lacks complexity but is quite drinkable. Read now. I have enjoyed a number of Pinot Noir from Peregrine Wines in the past but this one was sharper and more acidic than I expected. This is a very deep red (bordering on black) coloured wine that has a light plum aroma. On the palatte, the plump body consists of plum and cherry flavours, a medium tail, and a wine that was not as soft as I expected. The sharpness and acid did soften a little once aired. It was okay, but I do wonder if it would be better in another year. Epic Stout 2010… this is one heavy beer. Very dark in colour, this stout from the Epic Brewing Company is an international collaborative brew between NZ and the UK that is aged in oak and not for the faint hearted. On her first taste, Jane’s description is very apt. "It’s like chewing on a board of smoky cedar. Ohhh, but it has chocolate at the end of it." It has a nice chocolate aroma, a very strong smoky cedar & malt flavour with medium-long duration. For my taste buds, it’s a bit too heavy and bitter (I see it’s 6.8% alcohol, so that will be a contributing factor), but that may be more a statement of where I’m at on my stout journey. The beer did accompany chilli remarkably well, and Jane is quite happy to drink it again. We had a very disappointing meal out at Cardrona Speights Ale House in Mt Eden last night. We have been here in previous years and had good meals, but last night we were there with friends as part of the quiz and it was definitely not flash. I started with a Porter to drink which I thoroughly enjoyed. For my main I had the Drunken Steak which I requested to be rare. The majority of the steak was in fact medium-well and the sauce wasn’t anything special. Jane had the Pig Hunter, which is a huge pork loin; she enjoyed the dish. Others at the table had the salmon (described as the most tasteless salmon they had ever had) and a beef salad, that had more kumara than anything. For dessert I decided to have the Chocolate Mud Cake and Jane had the Cromwell Crumble. 45 minutes after placing our order I went and asked if they were far away and then proceeded to cancel the orders about another 10 minutes later. We got our refund but they did insist of bringing the desserts anyway and were very apologetic (which was good). The Mud Cake however came without the fudge sauce but the Crumble was good. So, all in all not a great night of food and we won’t be back in a hurry. We were planning on meeting friends for brunch on Sunday morning, and wanted to go somewhere that had an entertainment book coupon. We both remembered enjoying coffee at Shaky Isles previously so figured we'd give it a go. I do like the environment, and particularly the big outdoor benches. We sat inside on Sunday - it was reasonbly busy when we arrived, although got progressively busier and noisier during our brunch! You certainly couldn't say the place has no vibe! Their menu is a little different to the norm (a good thing! ), but delightfully flexible, so if you like your traditional eggs bennie, or scrambled eggs with bacon, you can build pretty much whatever you desire. Simon and I both had the Bruschetta with scrambled eggs, tomatoes, feta, spinach & basil pesto, Simon also had a side of spicy kransky. We'd both definitely order this again. One of our brunch companions had the Crumpet with dates, poached pear & orange ricotta - and a side of poached egg because that's what she felt like! I love that this was no hassle - I do get frustrated with cafes that are unwillingly or incapable of deviating from the exact menu. And the final meal at our table was the aptly named 'Isle have it all' - aka the big breakfast! It's safe to say we all enjoyed our meals and would more than happily return. Simon also had a kiwifruit, mint, lychee, banana smoothie - this was really good and very refreshing. My long black was great, as was my cappuccino. Simon wasn't sure about the blend used for his trim latte. I really appreciated that they use different beans for their different coffees - and you can swap and change here as well if you like. I'm tempted to order 3 long blacks one day - 1 of each blend, and do a vertical tasting! Love the flexibility of this cafe, the food is great, fresh & delicious, and the coffees seem dependable. We will return and we will recommend to others. I had another 'I really don't want to go to the supermarket' day today so had to get creative about dinner. The result was further proof that necessity is indeed the mother of invention. The only meat in the freezer was lamb shanks or a whole free range chicken - and arriving home at 2pm dictacted that these were not options! I did however have 3 cans of cannellini beans! Yay! I love them, Simon's not so sure. My resulting salad was fresh, vital and delicious. I really enjoyed the different textures - from the crsip fresh veges to the smooth avocado and the meaty cannellini beans. First make the dressing by combining all ingredients in a shaker or jar and shaking. Alter seasoning to taster. Absolutely delicious and nutrionally - well, you can eat this meal and feel truely virtuous! Mystery Creek Wines is a small vineyard located 10km south of Hamilton, New Zealand. With grapes from Clevedon (South Auckland) this pale straw coloured wine has very little to the nose and is actually reminiscent of a European white wine (a Chablis perhaps). To taste it blind, I think I would have picked it as an un-oaked Chardonnay. It was not at all what I was expecting for a Pinot Gris from this region, and whilst it does not taste like it has been done to the traditional Pinot Gris style it is in fact quite enjoyable. It has a nice mouth feel, that is not gluggy but has a nice warmth. Bizarrely, I smelt oysters to the nose when I first poured this wine. Jane however didn’t agree, but did note that is was not as grassy as she would expect for a Marlborough Sauvignon. This is quite a citrus-driven wine (which I did not expect in a Marlborough Sauvignon) and I found I also picked this up more on the nose after a few mouthfuls. This is a lovely drop that has a nice level of tartness and is drinking well now. Now that I've learnt how to make my own pasta, including fettuccine, ravioli, cannelloni and lasagne, I tend to me more reluctant to pay for it at a restaurant and will tend to opt for gnocchi which I've not yet learnt how to make! Well, I was very pleased I did order the pasta on Saturday, when I had the pleasure of joining friends at Ristorante Andrea in Mission Bay. I arrived a little earlier than my friends, and had no idea what name the booking was under, so after a confused conversation with the waitress, I lurked awkwardly on the footpath awaiting their arrival. The waitress soon approached me again and suggested I take a seat out the front while I waited - she was really nice about it and I appreciated being rescued! She continued to joke with us during the evening, along with providing really good service, as did the very Italian gentlemen who was also serving us, prompting us to order before the very large group that was settling in. I appreciated this quite homely feel and felt very welcome and like nothing was a problem. Shortly after we'd all sat down at our table I commented to my neighbour on the brown paper strips serving as tableclothes. Until we found the jar of crayons and all proceeded to draw, sign and photograph our various masterpieces! Love it! Anyway, back to the food! I ordered one of the many special pastas - Fettuccine alla Amatriciana. It was absolutely fabulous! A hint of spice, rich tomato, and bursting with flavour right to the very end. I absolutely would order this again. 4 of my companions also ordered pasta dishes, and I believe all enjoyed them. One pizza was ordered, and it looked really good, enough so that I'd go back for pizza as well. 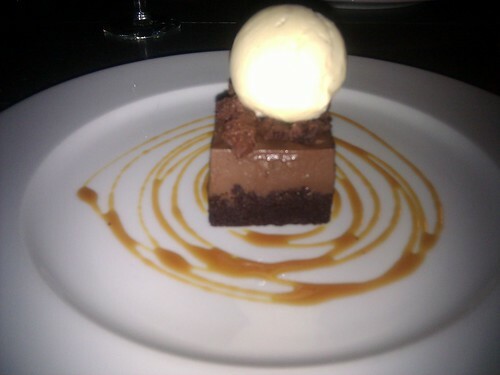 Most of us had desserts, and these weren't quite as rave-worthy as the mains, but by no-means complaint-worthy either. When I return I'm likely to have starters and mains rather than mains & dessert. In summary: comfortable friendly service, relaxed environment and really good pasta! Next time I'll take Simon, and I'll remember to take food photos. To accompany a spicy chicken dish this evening I opened up a Gewürztraminer from Moana Park in Napier that complemented it nicely. With a lovely golden robe, this wine is not as strong on Turkish delight / rose water flavours as many Gewürztraminers but the flavours are still there with a nice freshness and with a touch of sweetness. This is a lovely wine to drink and it is drinking well now. One of the restaurants we were determined to go to while in Sydney, based on a couple of recommendations from friends and from what we saw on their website, was Cafe Sydney, at the top of Customs House overlooking circular quay. I booked this one from home, knowing that you can't usually get a table without a reservation. The first thing that strikes you as you exit the lift and enter the almost alternate reality of Cafe Sydney is the incredible vibe and sophisticated party atmosphere of the place. The bar area is enormous - bigger than the restaurant at a guess, and furnished in a manner I can't help but call 'hip'. We were lead through the throngs of suited gatherings, had the steps pointed out to us (they must have heard about me and steps! ), and wound our way through the restaurant and out to the balcony (we'd requested a table outside - knowing that the views are amazing and that blankets are provided should you be cold). We started with a shared garlic naan bread (they seemed to do naans as their starting bread offering), then waited quite a while for our entrees to arrive. (And funnily enough, although the wait (which was close to an hour) frustrated me at the time, the whole experience was so good that I had forgotten about it until now). I had the Morton Bay Bug salad. This was fantastic - so full of flavour, with a touch of avocado and fresh citrus. I'm not sure that I've had bugs before, but I would certainly have them again. Simon had Peppered Tuna & Veal Carpaccio - this was beautifully presented and very flavoursome. For mains - Simon had the S.A. Jewfish and I had the Queensland Grilled Prawns. Both were lovely, my prawns were the biggest I've ever seen. Simon had the special dessert - a mango & coconut trifle with mango sorbet and sesame crisp - absolutely delicious! I had the Dark Chocolate Pave, which was exactly what I was hoping it would be (sorry about the over exposed ice cream scoop in the picture). We had a fabulous evening, thoroughly enjoyed the friendly and polished service, the vibe of the venue, the amazing views and the wonderful food. Yes we would dine here again, and yes we are recommending it to anyone visiting Sydney and wanting a classy meal in a fabulous location. Manly is a 30 minute ferry ride (on the standard ferry) from Circular Quay in Sydney CBD, and is like a laid-back beach location. It is nice place to relax, yet have lots of great cafes and luxuries around. It is however a very busy location, but it has a great buzz and is still a nice place to visit. One of the things I was hopeful of finding while we were in Sydney was a Cajun/Creole restaurant, knowing that we don't have one at home and with fond memories of the Creole Cafe we found in Launceston (Tasmania) last year. I was delighted to find South Restaurant online and swiftly made a booking! I'd read a fair few reviews before we went (there is another Creole restaurant in Sydney (Crows Nest) however South seemed to have better reviews and a more southern focused menu), so knew to expect a fairly tiny space, and based on some of the reviews I was expecting the prices to be a little on the higher side. Yes it was tiny (but still comfortable) and the prices were absolutely fine - and even better for the fact that we'd turned up on a Monday when all of their hot wings starter items are half price. We both had the 'Wing-Tips' for entree - this is a tasting plate (ha! it's a very generous taste!) of their hot wings (omg smell the vinegar, taste the spice, to die for!) and BBQ rib tips, served with a blue cheese sauce and fresh, crunchy celery sticks. We would both go back for this dish alone - absolutely deliicious, and even at full price of $AU16 is a cheap eat. Oh and I appreciate the little details - being provided with a bowl for bones and with refresher towels to clean your hands after you've finished licking all that scrummy goodness off them! Next we both chose items that we've not had before - Simon going with the Crawfish Etouffe and myself the Shrimp Creole, both with rice. While we both enjoyed these, Simon wasn't sure that the sauce with the Etouffe was entirely him (but he did completely clean his plate). There were plenty of other items on the menu that we would have love to have tried, but alas, we've managed to fill all of evening meals for the rest of the trip. The couple sitting next to us heard we were going to look at the dessert menu and strongly recommended we try the Cherry Cobbler a la mode (with vanilla ice-cream) - and then they managed to order the very last cherry cobbler!! So that was sadly not to be. But Simon had the pecan pie instead - which was fantastic - not too sweet and sticky, but absolutely delicious, and I had the lemon merinque pie which I had read in other reviews was to die for. It surely was pretty darned good. We both left thorougly replete and knowing we'd talk about the meal for months (if not years) to come. The service was relaxed, friendly and welcoming (the hotel had actually stuffed up our booking so we didn't have a reservation after all, but they were incredibly good about this and even phoned their other restaurant to check that the reservation hadn't been made there - and of course they found space for us - phew!). Darling Harbour is a lovely area of Sydney (despite being very touristy) and I love how art is just naturally part of the landscape. After standing in line for about 15mins to get tickets to the Sydney Aquarium (there is a lesson here in ensuring you buy tickets online prior to arriving) we then made our way into the enormous aquarium where we saw sharks, penguins, turtles, sting rays, coral, jelly fish and lots and lots of other sea life. It is well worth the visit. Last night we went to Cracked Pepper for dinner. I had the duck confit and whilst it was nice I thought it was missing a wow factor. Jane had the beef and it looked like they had cut it through the middle to see if it was cooked since each fillet was presented separately and only one side of each had been on the grill. Jane had a blackberry soufflé for dessert that was partially (although not fully) cooked, but she still enjoyed it. The service was pleasant but not fast. We started the day with a coffee and loaf at the Bliss Coffee Roasters in the Hunter Valley Gardens. One thing I continually forget is that skinny lattes (as they’re known here as opposed to trim lattes in NZ) are usually a single shot of coffee and not the double shot I have been accustomed to in Auckland. The Hunter Olive Centre was packed with people when we arrived, and for good reason, since they have an excellent range of oils, tapenades, vinegars and jams to taste. Hunter Valley Smelly Cheese (yes, that’s its official name) was our next stop. This is located in a magnificent complex with Tempus Two and another winery or two. Here, we enjoyed some more excellent cheeses. Tempus Two has a very upmarket cellar door presence and some lovely wines to taste. I particularly enjoyed the Pinot Gris which had a nice passionfruit flavour. The Chardonnay (50% Hunter Valley Grapes) is big and oaky and whilst it is quite drinkable now I fear it will become too oaky over time for my palate. Their Shiraz is a very light style that I can imagine being a nice and easy drink on a hot summers day. We popped into Adina Olives and tasted their small selection on offer. The Green Olive tapenade was my pick before I was also tempted to taste some of their wines. Of Adina Vineyard’s wines, I particularly liked their light and crisp Semillon, and found the Verdelho to be nice and dry with lots of flavour. Jane’s pick was the Dessert Semillon (an ice wine) that she found was more viscous than a table wine but not as sticky as many dessert wines. Leaves & Fishes is a beautiful restaurant located nestled back into the trees on Lovedale Road overlooking their pond. It is a lovely setting, has nice ambience and great service. I had a beautiful sesame-crusted fish fillet that was done in a Thai style with coriander, fish sauce and a very light chilli, and micro-greens. Jane had crispy pork belly with a magnificent side salad comprising caper-berries, gherkins, olives, sweet garlic, feta, fennel, pea sprouts, coriander and various lettuces. We would happily return although the prices are certainly premium. The Hunter Valley Chocolate Factory was our next stop, and we tasted a number of lovely chocolates and fudges. Great friendly service. After a detour via a geocache we had a cheese tasting at Benorrie Dairy. The Herb & Garlic Fromage Frais is lovely. I enjoyed the Valencay (white mould goat cheese), although this was too strong for Jane. The Marinated Fetta Gold Medal was exquisite and very smooth. The Labna had a nice garlic/rosemary flavour and lots of exciting complexity. The Brie was a bit mild for me, but the Washed Rind was more to my liking. The Duetto is a dessert style cheese that they do and I quite enjoyed the sweeter flavour however Jane was not keen on this one (which is not surprising given that it contained gorgonzola). The Apple & Rosemary paste was also really good. We were also appreciative of the friendly service of the woman in the store. In the same complex as the Benorrie Dairy is Arrowfield Estate. Once I finally got some service I decided to try their Riesling. This is a citrus-dominated Riesling that is enjoyable. I also enjoyed their Cabernet Merlot. We had a nice meal on Friday night at San Martino Restaurant at the Hunter Resort on Hermitage Road in Pokolbin. I had a lovely fillet of beef that was very tender and cooked rare (as requested). Jane had a spatchcock of chicken that was supposedly marinated, however I suspect it only got its marinade seconds before hitting the pan and it could have been a little more moist. The amount of vegetables with the spatchcock was very stingy, and no vegetables or salads were available to be ordered as sides. The main meal took approximately 45mins to arrive after ordering, but other than that the service was friendly and good. The ambience in the restaurant was also good, although we did notice that the cd was obviously on repeat. We finished with a Chocolate Torte and Macadamia Tart, both of which were good although the Macadamia Tart was easily my pick of the two of them. We would return, but would make sure we had plenty of time. After a great night out at the Night Noodle Markets in Hyde Market with friends (and a zillion other people, with huge lines to boot, but an excellent experience none-the-less) on Thursday night, we headed up to Pokolbin in the Hunter Valley wine region on Friday (via one cache on the way). Approximately two hours drive from Sydney, the Hunter Valley comprises myriad vineyards and surprisingly (to me at least) lots of cheese dairies. The Hunter Valley Cheese Factory was the first dairy we visited and we found a very high calibre of cheese. I particularly liked their washed rind cheese (which had a nice bite to it) and their blue cheese (that was very light in blue flavour but lovely and creamy). After checking in at our accommodation on Hermitage Road we headed along the road to Emerson’s at Pokolbin for lunch. They have only been open for 3 weeks (according to the chef/owner) and are doing tapas style meals. The duck liver pate was divine and one of the best we have had. We also had garlic prawns and calamari, both of which were okay although lacked a wow factor. We were impressed however that the chef/owner came out and asked us what we thought of the meals and took a genuine interest in our feedback. We then ventured on to Piggs Peake for our first wine tasting and they were okay but nothing noteworthy. They were very friendly and gave generous tastings. I do wonder though whether since they were the first vineyard for the day and our first for this region whether I was being overly critical. DenMar was our second vineyard and there was yet again nothing jumping out at me. I also found that their Pinot Noirs weren’t to my palate, but I think that may be more so due to me being more in-tune with NZ Pinot Noirs. Tintilla Estate was my pick of the vineyards on Friday, also helped by the exuberance of the wine salesman. He was a member of the family and consequently knew lots about their huge selection of wines and was very open to all feedback. I particularly enjoyed their Semillon 2010 and their Sangiovese 2009. I also really enjoyed tasting their selection of fortified wines. We then quickly grabbed a lovely cheddar cheese from Binnorie Dairy before they closed and had a taste of their washed rind cheese (which I enjoyed). We will return tomorrow for a proper tasting. We had another glorious day in Sydney today and started with a train trip out to Single Origin Roasters, which is a very busy little cafe hidden away in a side street in Surry Hills, where we had a lovely breakfast and superb coffee; Jane however wasn’t too fussed with her Chai Latte. We would happily return. We then walked along to Harmony Park and found a geocache before jumping onto the free bus that goes around the city and getting off at Circular Quay. We spent some time people watching and enjoying the lovely day around by the Opera House before heading around to the Rocks. The Rocks is one of those areas of Sydney I enjoy walking around the streets and looking at the old buildings. It has a nice feeling, all-be-it quite touristy. Our stomaches were craving some food so after deciding that most of the restaurants on the waters edge by The Rocks would be a bit too heavy on our wallet for lunch we went to Cruise Bar at the Circular Quay end of the The Rocks promenade and had a lovely lunch, whilst fending away the seagulls and narrowly missing being shat on. We then were engulfed by hundreds of firemen/women who were preceded by a band. We have no idea what they were doing there, but it provided a nice buzz. After a nice bite to eat (and a good coffee) across the road from our hotel at Bluestone in O’Connell Street we ventured to George Street where Jane noticed that there was brail next to the button to cross the road. Something so simple, I imagine can be extremely useful. As were were finding our first geocache for the trip in Lang’s Lawn we even found that they cage children here. We were however pleased to see that we weren’t the only people looking on very curiously. We then wandered along to a board game store called The Tin Soldier at 40 York Street that is down in the basement of the building and has an excellent range, where we bought a card game (Backpacker) but may yet return to buy something else. We then wandeWe then ventured along to the glorious Queen Victoria Building before it was time for Jane to spend ages and ages in a costume jewellery store; she eventually emerged with a couple of items. Walking through an underground corridor we emerged at Myers and then wandered across to David Jones where the array of ladies shoes was mind-boggling. After investing in some shoes for Jane we then watched a very serious chess match over at Hyde Park. After 5 minutes we still hadn’t seen a move taken and the concentration was very intense. I do like the idea of the outdoor chess set. After a nice salad for lunch in the lovely Strand Arcade at Strand Expresso we then headed back to the hotel for a bit of R&R before I got bored and wandered along to Custom House (by Circular Quay) where there was a pipe art form just begging for photos to be taken. I then proceeded from here along to the Opera House and got a bit trigger happy with the camera (as I’m sure most people do) and took the obligatory shots. I don’t know where we’ll head to for dinner tonight. We had an excellent meal at the Bavarian Bier Cafe in O’Connell Street last night, with a schnitzel that was ridiculously large finished off with schnapps (a cow bell was even rung as the schnapps arrived, which is apparently tradition). Perhaps we’ll go to the Japanese restaurant the concierge has recommended. Last night I made what Simon concluded was 'the best pasta I've made yet'. 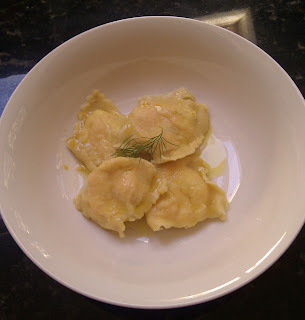 I wasn't sure how well this one was going to work out - while I was scouring the web for similar recipes, I was surprised to find that pretty much all the salmon ravioli recipes called for smoked salmon and not fresh salmon. But in my head it seemed to me be do-able, so I went with it and I'm really pleased with the result - and I'm very glad I have leftovers for lunch today! Note: the photo is of the leftovers that I cooked up today and unfortunately I hadn't dried them sufficiently before storing them, so they're not quite as plump and attractive as last nights, but still a reasonable depiction. Refer to this post for details of my dough, make for 2 people (note I now make it in the food processor rather than all that upper-arm toning kneading - it's just so much quicker). First make your dough as per the instructions referenced. Leave to sit for about 30 minutes while you make the filling. Skin the salmon then slice and then re-slice into small pieces - I ended up with mostly 10mm by 10mm by 5mm pieces or perhaps a smidgen smaller. Place in a mixing bowl. And place the sauce ingredients (including the remaining finely grated rind of the lemon) into a pan ready to gently heat and infuse prior to serving. Now roll your pasta through the pasta machine doing the usual process of going through number 1 and folding and back through number 1 and folding several times until the dough is smooth, then eventually rolling it through to number 5. I did this in several batches - such that I filled a tray of ravioli before rolling the next lot dough. Place the dough over your ravioli tray (after my 1 exasperating attempt at making ravioli by hand I refuse to do it without my raviolamp tray ever again). I'm using a tray that does 12 good sized ravioli. Place a spoon of the filling in each depression then cover with another layer of pasta and use the rolling pin (and your fingers) to seal the edges then remove the ravioli from the tray. Repeat until all your filling has been used. Place about 12 ravioli in the pan of boiling water at a time and cook for 4 minutes with a dollop of oil to prevent them sticking. While the ravioli are cooking, agitate the oil a couple of times - you're not aiming to bring to a high temperature here, just to warm it and release some of the flavour from the lemon & garlic. Drain the ravioli then serve in pasta bowls, dressed with the infused oil. We enjoyed this with a beautiful oaky Clearview Estate Chardonnay. Last night I made Cornish Pastys again, this time however I also made the pastry instead of buying it ready-rolled, and for the first time ever I used the (apparently) traditional short crust pastry instead of flakey-puff. I'll now continue to do so! The result was fabulous and very very yummy. Chop the butter into small cubes (about 1cm), add flour & butter to bowl of food processor with metal blade. at this point Simon offerred to make a J and an S from the left over pastry, so he did that while I filled the pastry with the pasty filling, rubbed the edge with milk, folded over, formed the crimp and brushed the resulting pastys in milk. add the initals (this point is optional in case you were wondering!) and brush them with milk too. Serve with my dad's delicious tomato relish and devour while admiring your handiwork with that delicious golden, crusty pastry outer. Several months back we had a hankering for a raw-fish style meal and tried to find a quick and easy recipe. I'd remembered watching a Jamie Oliver episode where he made ceviche in a matter of minutes with minimal marinating time, so was really surprised to discover pretty much all the recipes I found online required marinating the fish for a minimum of 2 hours. This is simply not a style of cooking that is compatible with my naturally impatient approach to meal preparation! We came up with something and I must have hastily scribbled down the recipe, because when I came to make it again tonight, Simon found the piece of paper scrawled with red pen and I spent the next 10 minutes while I prepared dinner, and then again at random intervals for the next couple of hours going " 'SMASH', what on earth did I mean?" as there is a commandment in the middle of the page in solidly printed capital letters - SMASH. Weird. And there are ingredients in the list that don't feature in the instructions, then things in the instructions like 'add garlic' when there is no garlic in the ingredient list!!! [later: I re-read the recipe and found garlic powder] I have no idea what was going on there. To ensure I have an easier time of it next time, I am going to record how I made tonight's rather delicious ceviche. add about a teaspoon of salt (yes, a whole teaspoon), then (and this is where that commandment comes in) SMASH. Hehe. So in more helpful terms, use the back of a spoon to smoosh the ingredients together - I have no idea why, maybe it helps release some of the flavour from the chilli. It's fun anyway, so just do it. Slice the fish into thin strips and add to the marinade, check the salt level again then leave for 1-2 minutes. Serve! Yep, it's that easy! Tomorrow night, I'm making salmon & ricotta ravioli because a friend told me she remembers once having ravioli with some sort of divine salmon filling when she was in Aussie once and it was so good she can all but still taste it. Random inspiration. It sounded like a challenge. I can't resist a challenge. With passionfruit and light kerosine to the nose, this light gold coloured wine is big and bold to taste with passionfruit being the dominant flavour. 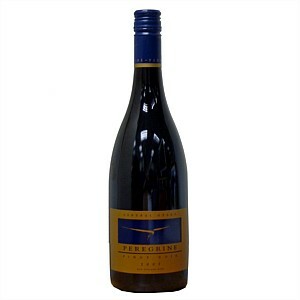 It is an enjoyable wine to drink that has a long aftertaste and is drinking well now. For the first time in at least two years we decided to give Eight Point Two a go this evening. We had not been impressed previously with the food, service or the general vibe but tonight was quite a different experience. We were met by a very cheerful waitress and seated shortly thereafter. There was an excellent vibe in the restaurant and it was almost full. We had excellent professional & friendly service throughout the evening, and our water glasses were continually refilled in a timely manner; we also received good, knowledgeable advice about wine matches. The menu is not extensive and a little more variety would have been nice, the wine list however has a nice variety. We started with the “Ciabatta, roast garlic butter” which was as simple as it sounds. I then followed this with the “Hapuka, cauliflower, blood orange and sherry vinaigrette” which was nice however it didn’t have a wow factor; the hapuka was perfectly cooked and a decent sized portion but it lacked anything special whatsoever. Jane had the “Pork Involtini, prosciutto, Sicilian stuffing, courgettes, pinenuts” that she found was a little on the tough side, but enjoyed none-the-less. We accompanied our meals with a “Mixed Green Salad, whitlof, rocket” which was simple but good. For dessert, I thoroughly enjoyed the “Chocolate Terrine, orange, cognac raisins, candied zest”; it was rich with chocolate without being too rich. Jane also enjoyed her dessert, “Caramelised Muscato Tart, whipped cream”; it had flavours akin to an apple strudel and a creme brulee. All in all we had a nice evening, and despite our main meals not excelling we will look to return at some point. With light leather and dark plum to the nose this wine has a magnificent ruby red colour. The dark plum flavours follow through to the palate and are also complemented with some dark berry flavours. For a 2004 wine, this wine is very tannic and also very dry. The structure of this wine will support much longer cellaring. Pale gold in colour, this wine has a magnificent aroma; it has sweet and citrus characteristics with a hint of oak. It is even more sweet to taste but is well balanced with a solid citrus acidity, so the sweetness is not overpowering as all. It is a full-bodied wine with a medium-long tail. This is a very enjoyable wine to drink. Drinking well now. Clearview Estate is an excellent vineyard located next to the sea in the Te Awanga region of the Hawkes Bay. We had the pleasure of a wine tasting this evening with the full-of-life passionate Tim Turvey (owner & winemaker) at the North Shore Wine & Food Society. It was a magnificent evening and Tim brought along lots and lots of different wines to taste (some of which had only been bottled last Monday, such as the Blush Rose!). I’m not going to critique each one, in fact there are already some I’ve reviewed on this blog before, but provide my general thoughts. The white wines were my pick of the evening. In fact there was not a single wine I tasted this evening I would not happily go out and buy. The Gewürztraminer wasn’t too heavy on Turkish Delight, the Semillon was lovely and delicate, the Reserve Chardonnay was as good as ever and as for the 2007 Endeavour Chardonnay (Cellar Door Price $250) this was magnificent, well balanced and very smooth. In terms of the reds, the Pinot Noir des Trois was quite an interesting drop with Pinot Noir from three different areas of New Zealand coming together to form this nicely layered wine. The Blush Rose was also lovely to drink. The pick of the reds though had to be the 2007 Basket Press ($140); this was so flavoursome and perfectly balanced. A very enjoyable evening and for white wines, in particular, Clearview Estate may now be my favourite vineyard. With a beautifully soft toffee and grapefruit nose, this is a remarkably well-balanced wine. It has light acidity, toffee and citrus flavour to taste. It is so well-balanced in fact that the french oak flavours are almost non-existant. This is a magnificent wine that has complexity that begs for another taste. Drinking well now. This light golden hue wine has a very soft earthy nose. It is quite a fat wine with light french oak flavours and a little bit of a lemon tang. It has a long tail, is very soft, easy to drink but I’m not feeling any wow factor. Slice the leek into rings about 5mm wide. Cook the potatoes in the chicken stock until tender. Meanwhile, fry the leeks in the butter (or evoo if you prefer) until soft. Don't drain the potatoes! Use your potato masher and lightly crush them, while still in the stock. Add the cooked leeks to the potato & stock mixture, season with pepper (again, add salt if it needs it, mine certainly didn't). Add milk, reheat & serve. Simple, easy, tasty. What more could you ask for? We used Google Places on my phone recently to find somewhere new to try for brunch. 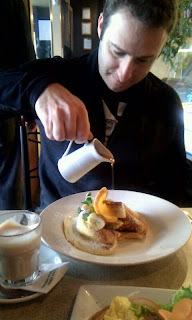 We chose Lulu's Cafe on Ponsonby Road. The cafe is quite small, homely and perhaps a little Italian and cosy in atmosphere - the cafe as a nice feel to it and I can imagine myself sipping coffee there and people-watching. They don't take credit cards - I mention this only because I think it's the first place I've come across in Auckland that doesn't! Simon had the pancakes with lashings of Maple Syrup and I went for an Omelette with fresh garden salad. I'm always a little dubious about ordering salads as they're often the ubiquitous mesclun mix plopped on the plate and served. This however was fresh, generous and absolutely delicious. 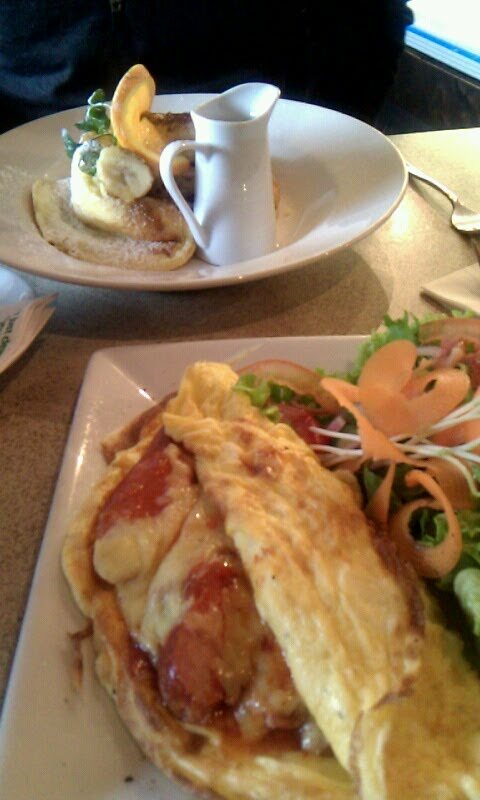 The omelette was also great, and very filling! Would we return? Yes, although we wouldn't call it a favourite. But if you were thinking of visiting Lulu's, we'd certainly encourage you to give it a go.